Stem cells are the basis for the continuous regeneration of all tissues in our body - but they can also play a disastrous role in the development of cancer. Most cancers originate from stem cells that have undergone pathogenic changes. These cells are also responsible when the cancer spreads in the body and is resistant to commonly used therapies. Andreas Trumpp has been awarded this year's Baden-Württemberg State Research Award (Landesforschungspreis) in Applied Sciences for his outstanding scientific accomplishments in research on cancer stem cells. For the past ten years, Trumpp has been heading the Division of Stem Cells and Cancer at the DKFZ as well as the Heidelberg Institute for Stem Cell Technology and Experimental Medicine (HI-STEM). HI-STEM was founded in 2008 as a public-private partnership of the Dietmar Hopp Foundation and the DKFZ. "Andreas Trumpp is one of the world's outstanding scientists in the area of cancer stem cells, to which he has made instrumental contributions with his work," said DKFZ Chairman and Scientific Director Michael Baumann. "Research has already profited tremendously from Trumpp's scientific results – and in clinical application they may be a true stroke of luck for many cancer patients." 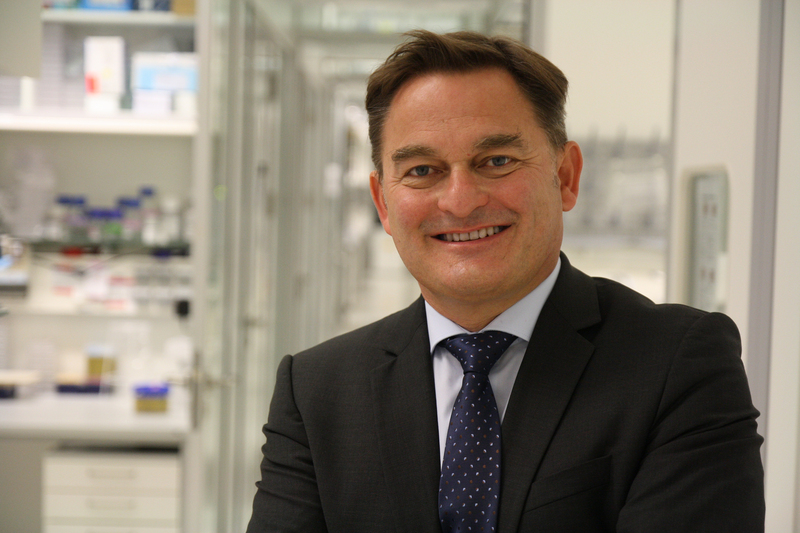 Dietmar Hopp said: "Andreas Trumpp has succeeded in building an excellent team and pursuing very high-level research without losing track of the patient. I congratulate him on this deserved distinction." "Cancer stem cells are a fascinating area of science," said award winner Andreas Trumpp. "Our results contribute to enhancing our understanding of the way our body functions. At the same time, we directly contribute to making therapies more effective in order to better help cancer patients in the future. I am very happy about this wonderful appreciation of our work. For me and my fantastic international team, this award is a great incentive and an important motivation." The goal of Trumpp's research is to elucidate the molecular control and the function of normal and of pathogenically altered stem cells in order to find new approaches in cancer therapy. His spectrum of topics ranges from research on basic mechanisms in stem cell biology to the development of new approaches and markers for cancer therapy. Trumpp and his colleague Marieke Essers became internationally acclaimed for their discovery that blood stem cells in the bone marrow protect themselves from harmful environmental influences by assuming a kind of dormant state. They only become active in an emergency such as infections or heavy blood loss. In these cases, they start dividing, thus providing the urgently required new supply of red and white blood cells. The dormancy also explains why blood cells as well as leukemia stem cells fail to respond to many anticancer drugs and chemotherapy: The substances only attack actively dividing cells. This principle of the "dormant" stem cell discovered by Trumpp is generally accepted by now and has major implications for cancer therapy because the dormancy of stem cells is associated with resistance against chemotherapy, which is directed against dividing cells. On this basis, the scientist was able to show that prior treatment with the immune messenger interferon-alpha can activate dormant resistant stem cells and thus make them susceptible to subsequent chemotherapy. Prior treatment with interferon-alpha, followed by chemotherapy, may therefore be the first-ever possibility to eliminate resistant cancer cells efficiently. Additionally, over the past few years Trumpp has been able to translate numerous other research results from basic research into clinical research. For example, he was the first to identify, jointly with colleagues, metastasis-inducing stem cells that can lead to the formation of distant secondary tumors in the bones and liver. The research team is now focusing on enhancing methods to multiply these breast cancer stem cells isolated from the blood of patients in the Petri dish. Sufficient quantities of tumor cell material could make it possible, for the first time, to examine each patient gently in the course of the disease to find out how the resistance against anticancer drugs arises and which substances might be an alternative. In a study on pancreatic cancer, Andreas Trumpp, Martin Sprick and colleagues were able to detect a new drug resistance mechanism. In this type of cancer, they found that the cancer cells of the pancreas produce large quantities of an enzyme called CYP3A5, which is normally only active in the liver to break down toxic substances. In pancreatic cancer cells, however, it renders various drugs ineffective. When the researchers blocked the enzyme, the cells became responsive to therapy again. Based on these findings, the scientists are currently preparing a clinical trial in collaboration with clinical partners. They intend to examine whether an already approved drug can prevent resistance from developing. Trumpp and his co-workers discovered another enzyme that might serve as a starting point for new therapy options in acute myeloid leukemia (AML). The stem cell researchers discovered that an enzyme called BCAT1 unexpectedly influences gene activity and acts as a cancer promotor in AML stem cells and other cancer stem cells. A blockade of BCAT1, which previously was only known as a metabolic enzyme, using a targeted agent might also reduce cancer spread and therapy resistance. Andreas Trumpp (*1964 in Heilbronn, Germany) studied Biology at the University of Freiburg and subsequently earned his PhD at the European Molecular Biology Laboratory (EMBL) in Heidelberg. From 1993 to 2000, he pursued postdoctoral research at the University of California in San Francisco at the lab of Nobel Prize laureate J. Michael Bishop. In 2000, Trumpp was appointed research group leader at the Swiss Institute for Experimental Cancer Research (ISREC) in Epalinges/Lausanne. In 2005, he was additionally appointed assistant professor at the École Polytechnique Fédérale de Lausanne. Following his appointment as head of DKFZ's Division of Stem Cells and Cancer, he also founded the Heidelberg Institute for Stem Cell Technology and Experimental Medicine (HI-STEM). HI-STEM was founded in 2008 as a public-private partnership of the DKFZ and the Dietmar Hopp Foundation. Its aim is to conduct high-end basic research on normal and malignant stem cells as a basis for developing new approaches in the diagnosis and therapy of cancer. Trumpp is the author of over 140 scientific publications, mostly in prestigious specialist journals such as Nature and Cell. He also holds numerous patents, particularly on the diagnosis and therapy of pancreatic cancer, and acts as a coordinator in a multitude of scientific collaborations and committees in Germany and abroad. Use is free of charge. The German Cancer Research Center (Deutsches Krebsforschungszentrum, DKFZ) permits one-time use in the context of reporting about the topic covered in the press release. Images have to be cited as follows: "Source: Roman Jowanowitsch/DKFZ".